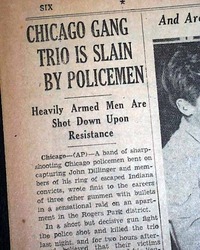 Public Enemies, Gangsters, & Organized Crime! 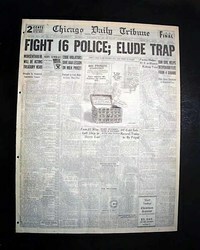 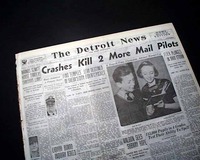 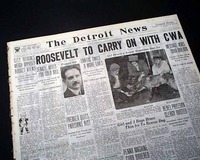 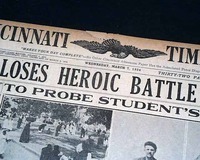 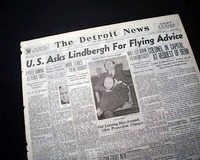 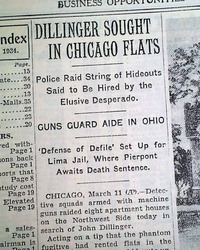 THE DETROIT NEWS, Michigan, March 10, 1934 This 22 page newspaper has one column headlines on the front page: "GUN FIGHT NEW DILLINGER CLUE" "Fugitive Killer Believed to Have Had Hand in Chicago Suburb Battle". 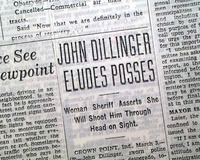 Tells of the hunt for John Dillinger who just recently made his famous break out from Crown Point IN jail with an alleged wooden gun. 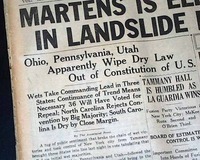 * "U.S. 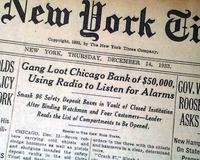 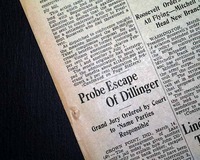 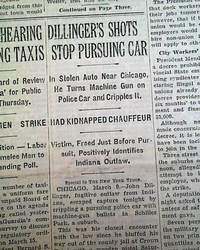 Joins Search For Dillinger In Chicago"
* "Two Indiana Jail Attaches Accused of Assisting Escape"
John Dillinger was one of the main figures in history for causing the establishment of the FBI that is so well known today. 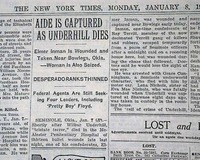 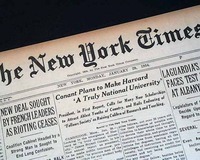 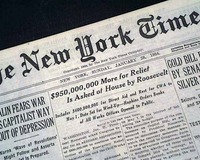 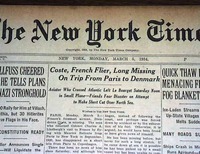 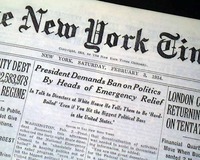 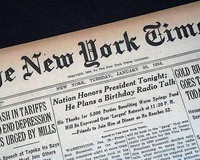 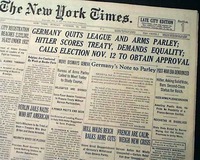 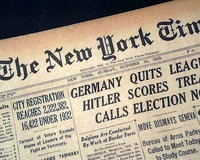 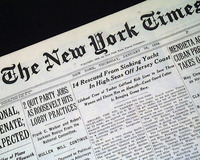 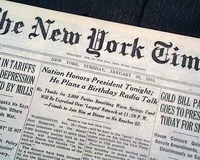 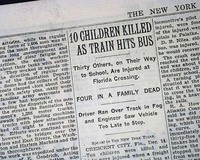 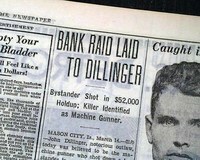 NEW YORK TIMES, February 3, 1934 Page 3 has one column headings: "Dillinger Is Reindicted", "Faces Death Penalty in Murder of Patrolman O'Malley"
This was when he predicted they could not hold him & soon after this, he escaped with his famous wooden gun at Crown Point Jail in Indiana. 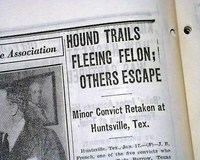 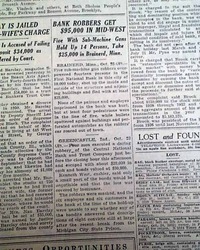 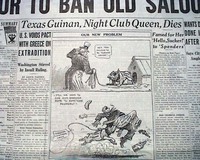 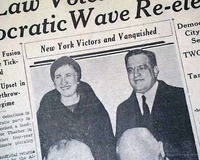 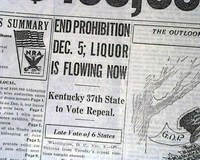 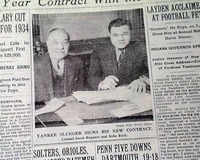 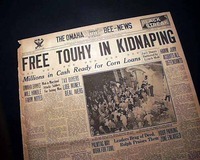 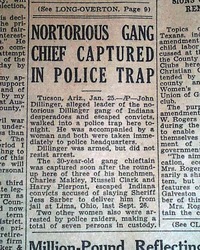 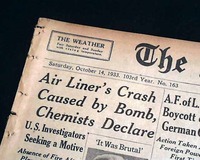 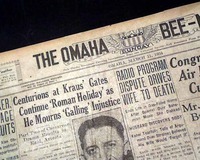 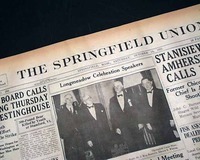 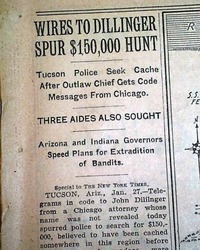 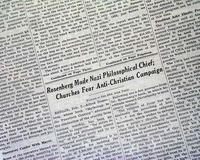 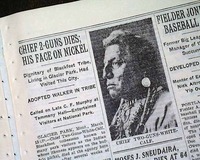 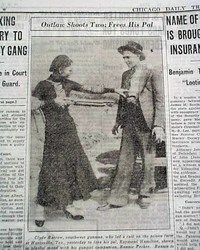 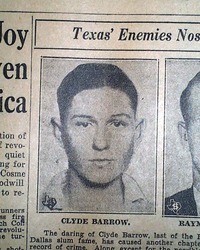 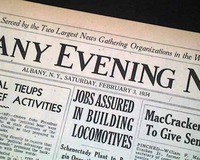 This 40+ page newspaper has one column headlines on page 5: "INDIANA TO GET DILLINGER GANG" "Extradition Plans Are Announced at Office of Governor of Arizona"
This 24 page newspaper has a great banner headline on the front page: "FREE TOUHY IN KIDNAPPING" with subhead. 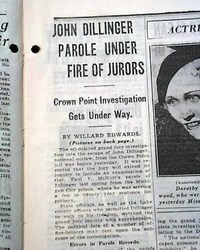 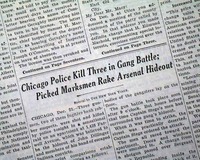 (see) Tells of Chicago mob boss Roger Touhy being acquitted for the kidnapping of millionaire William J. Hamm Jr. 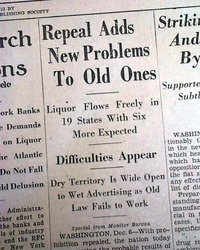 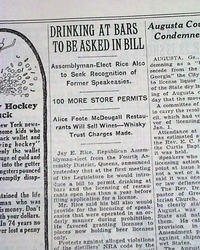 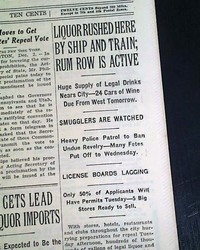 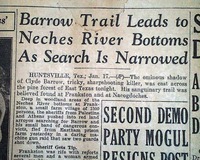 This 18 page newspaper has one column headlines on page 7: "OFFICIALS PUSH THEIR HUNT FOR OUTLAWS" "Floyd, Underhill and Miller Sought, Now That Bailey and Kelly Have Been Convicted"
THE DETROIT FREE PRESS, Detroit, Michigan, October 14, 1933 This 22 page newspaper has one column headlines on page 2 that read: "Island Prison for U.S. 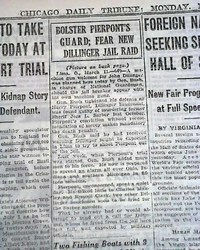 Felons" "Old Pacific Fortress to Hold Badmen"
Tells of the acquirement of Alcatraz Island by the U.S. Dept. 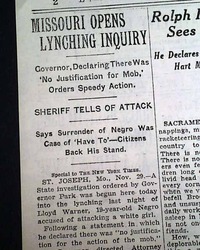 of Justice.